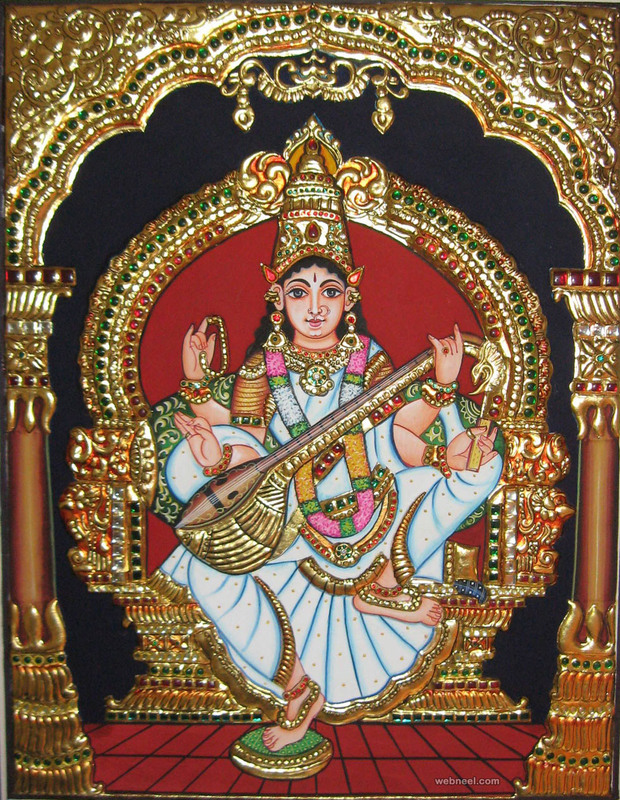 Tanjore paintings or Thanjavur paintings have been popular from 16th century during the Marathas invasion to Southern india. 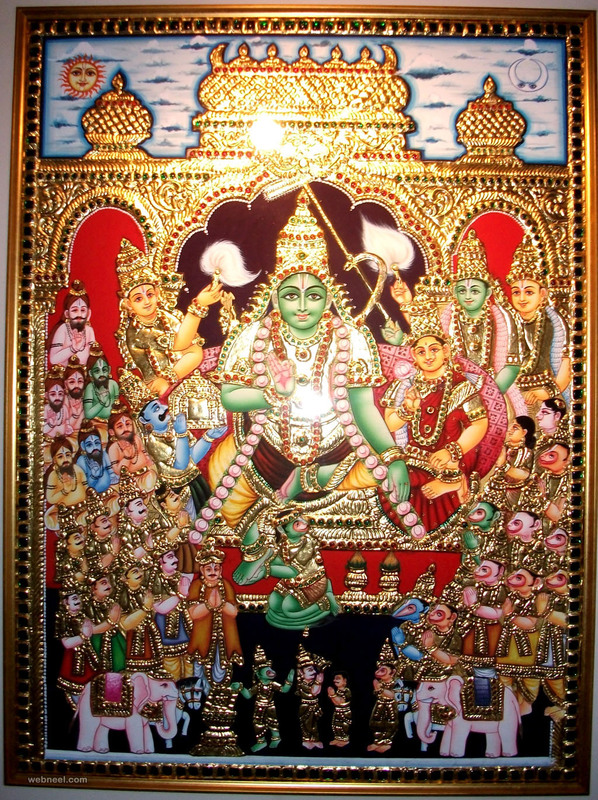 If you have visited the temples in South India, most of them will have pictures of gods and goddess which are Tanjore paintings. 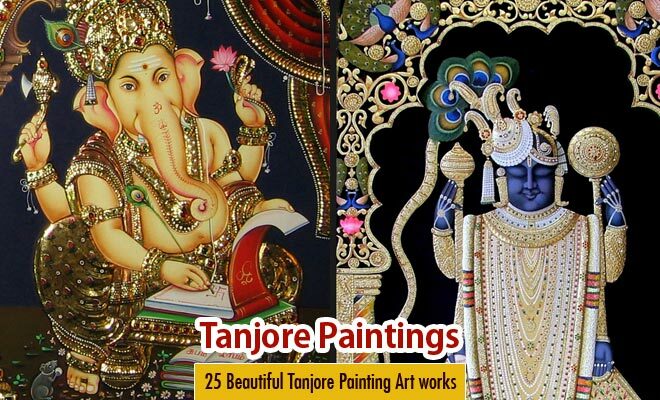 It’s believed tanjore paintings started from Thanjavur a small town in Tamil Nadu and hence the name. 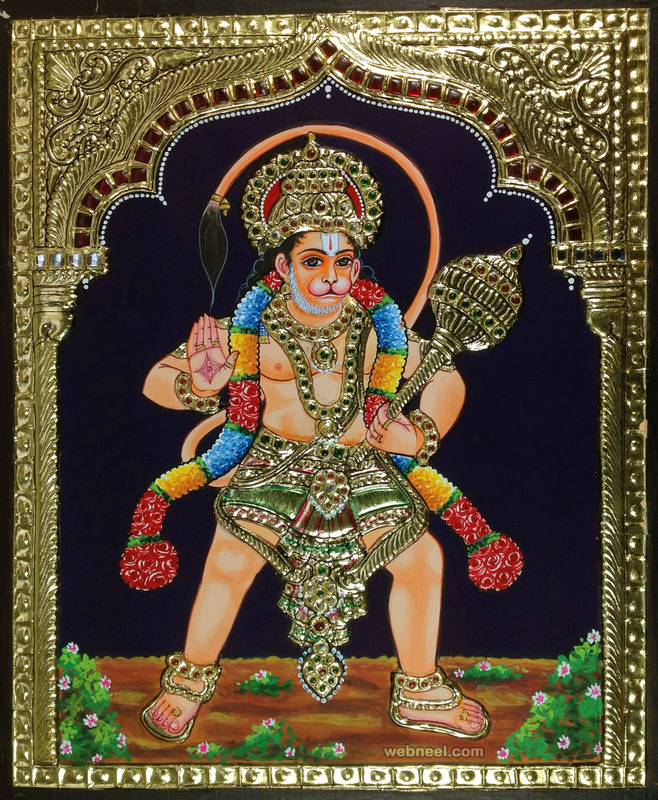 Thanjavur district is quite popular for it’s toys and crafts. 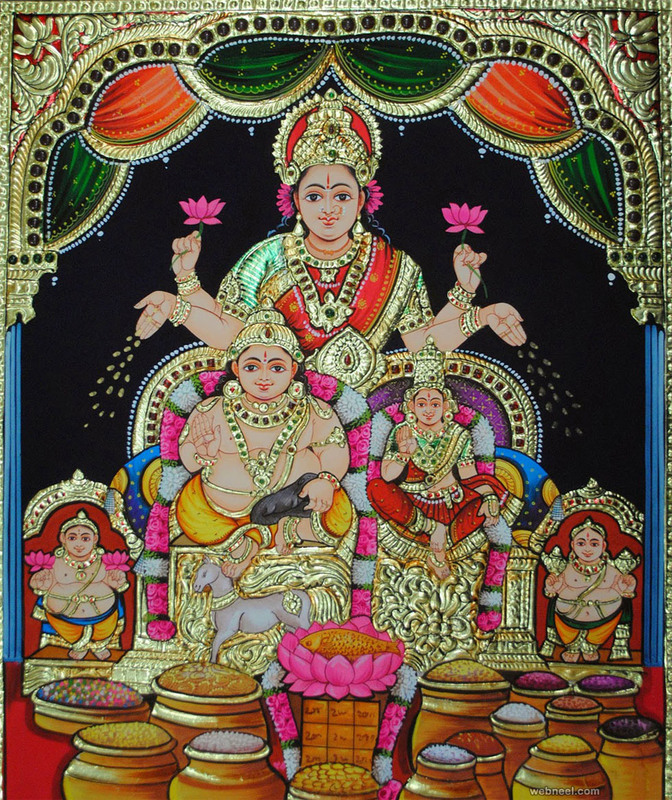 The famous Thanjavur thalai aati bommai was created here. 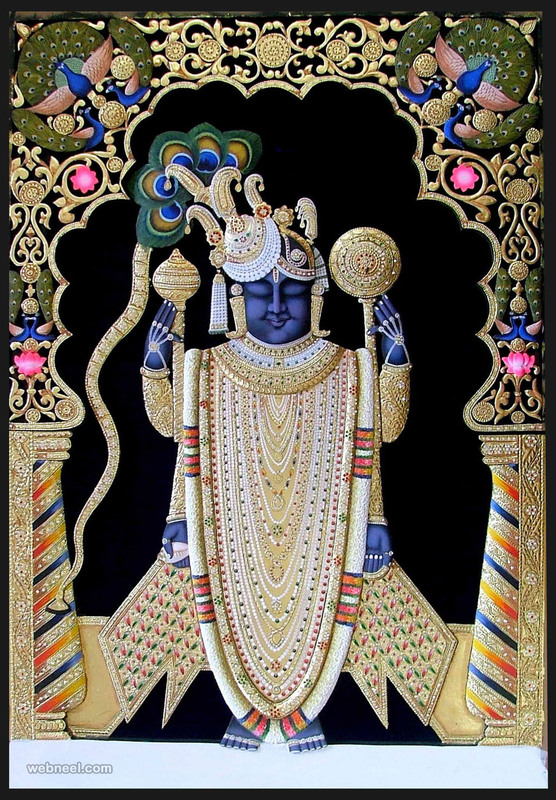 These are simple standing wooden toys, but these are special head shaking toys. 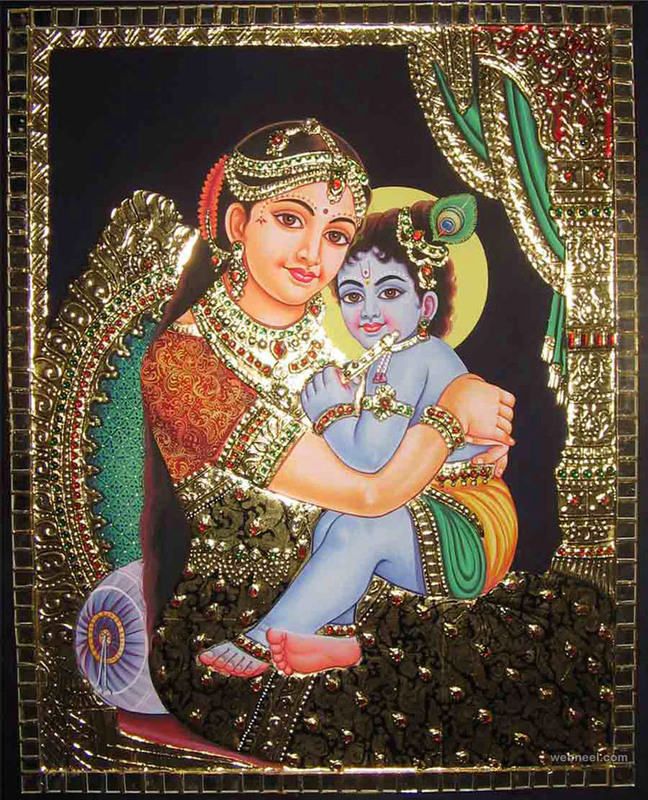 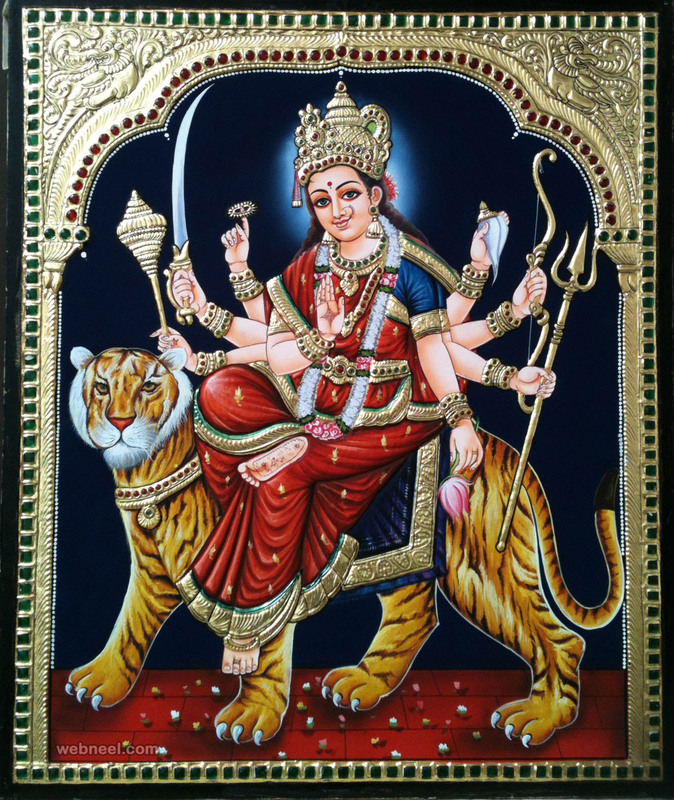 visit Top 20 Tanjore Painting artists and art galleries post. 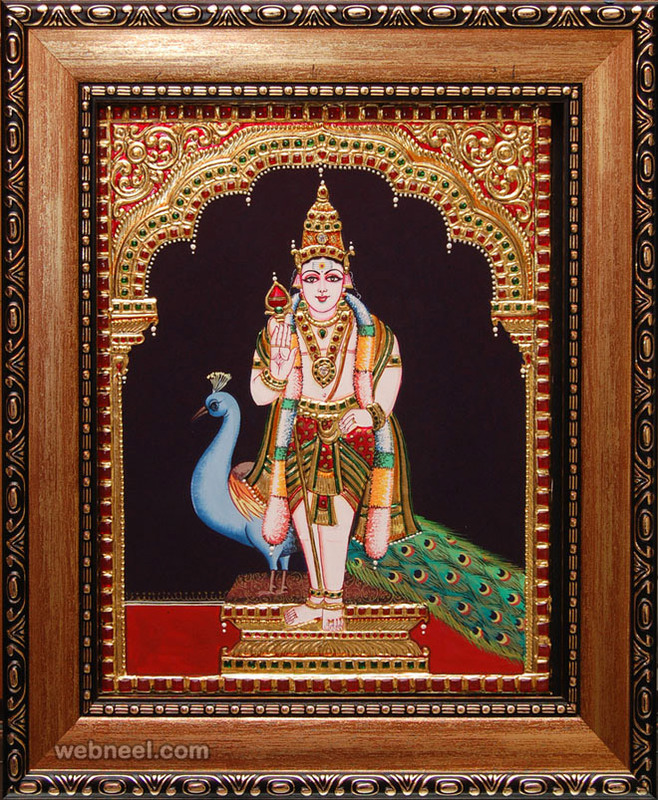 Tanjore paintings are created in several stages, the toughest being creating the canvas. 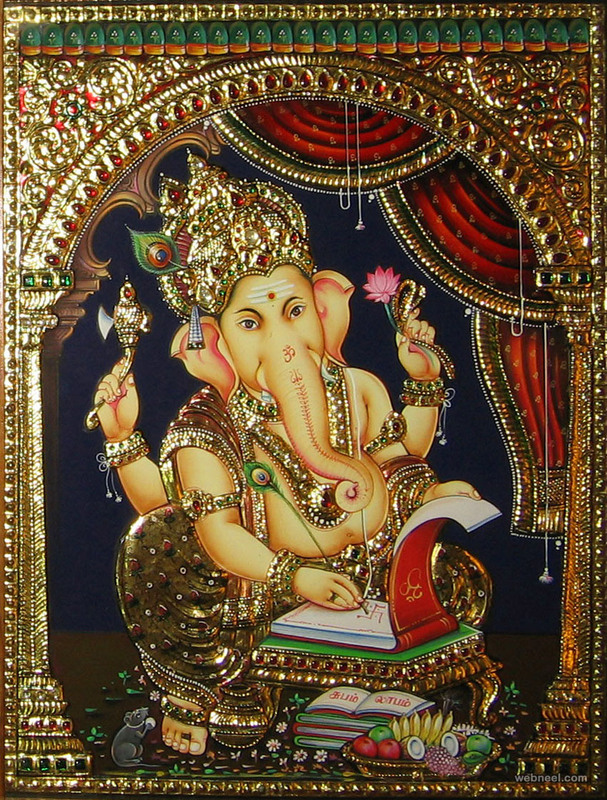 Fevicol, Arabic gum and chalk powder are used to create a muck paste, which is then applied on a white muslin cloth and pasted on to the plywood. 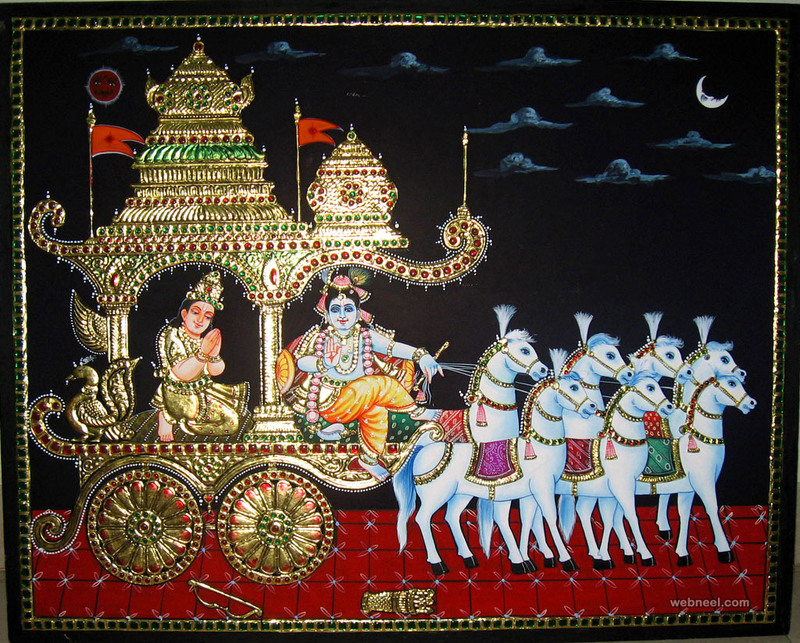 During early days, diamonds, rubies etc was used to create these tanjore paintings, nowadays semi precious stones like Jaipur gems is used to create these popular paintings. 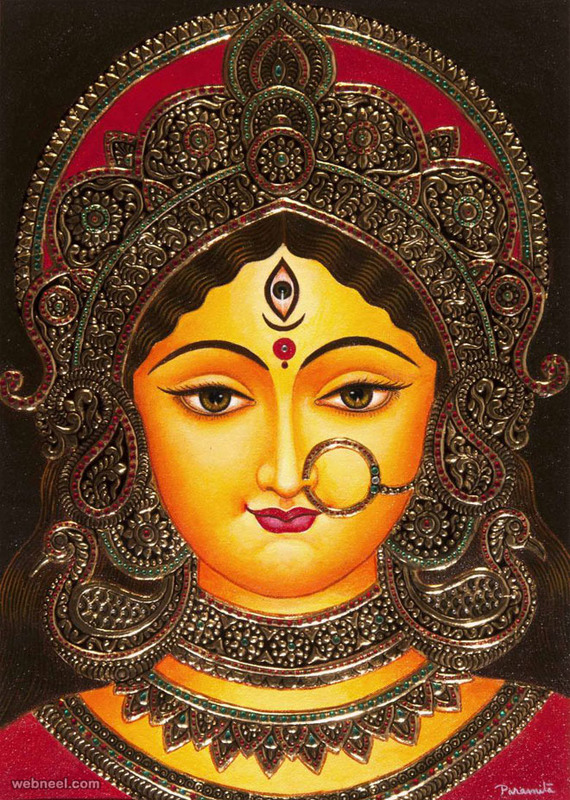 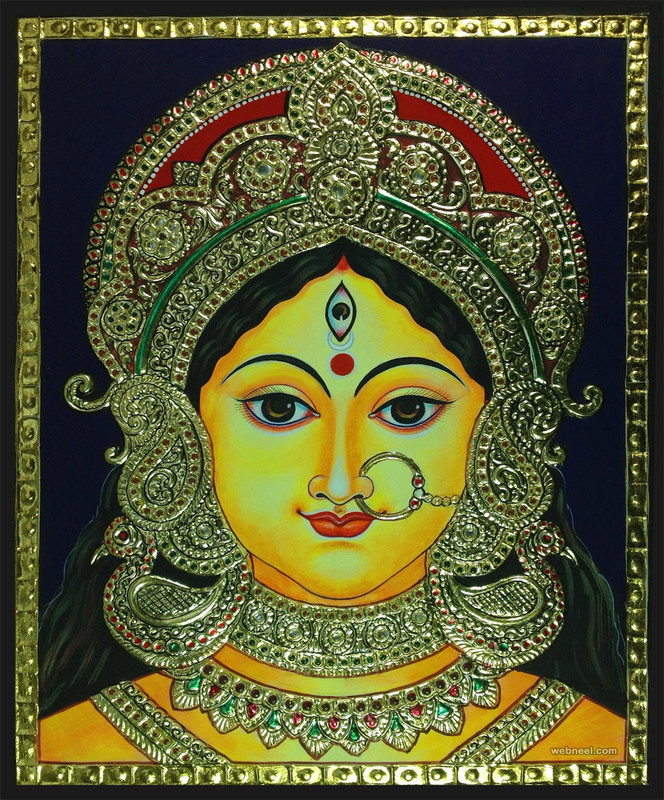 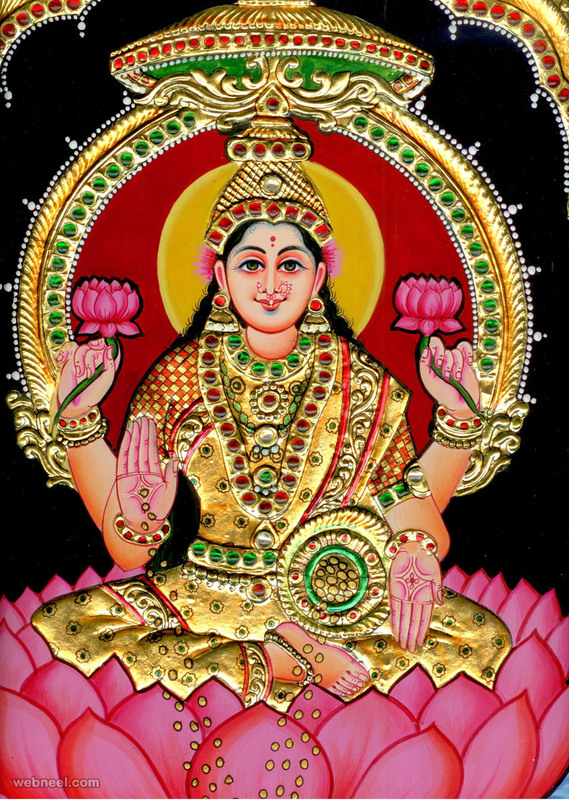 The gods and goddess are adorned with heavy jewellery and background is pasted with 22-carat gold foil and the remaining available space is coloured in bright colours, which makes these paintings unique. 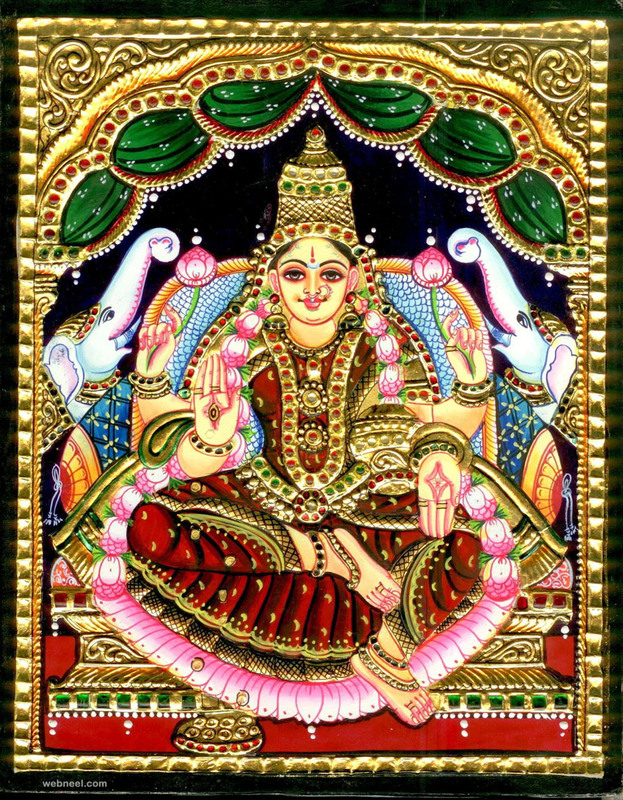 History of Tanjore paintings: Tanjore paintings are also popularly known as Thanjavur paintings named after a place in South India. 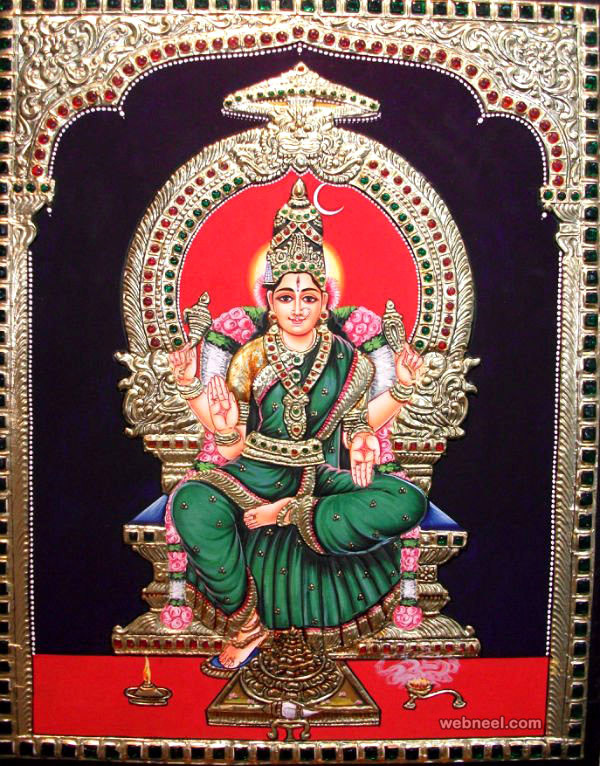 These tanjore paintings evolved during the 16th century when the Chola emperors ruled southern india. 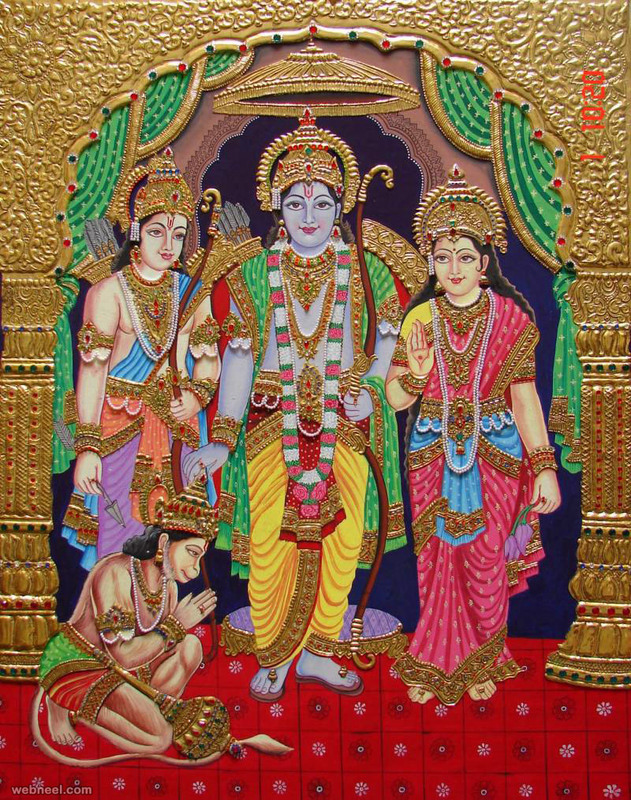 Like we all know, Chola emperors were great lovers of art and built beautiful temples. 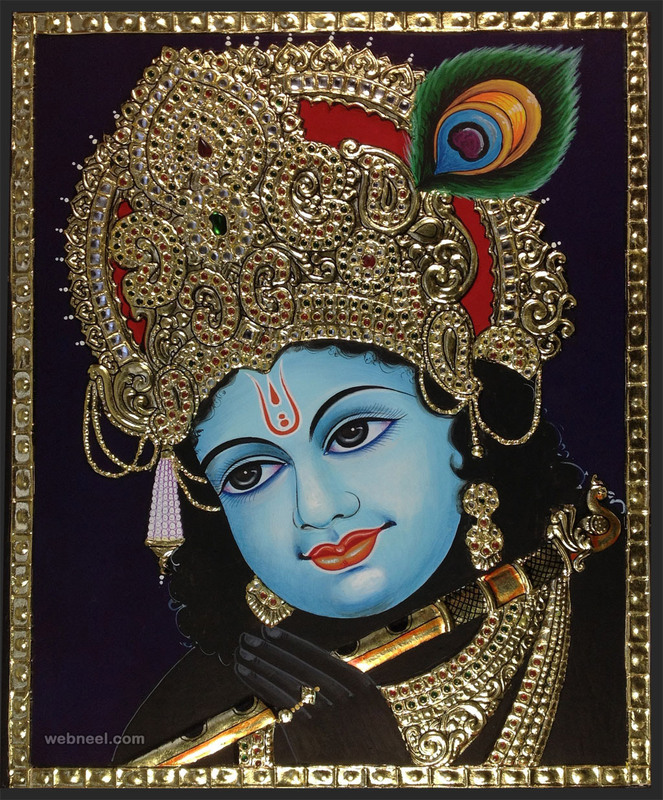 Eventhough these paintings have been popular from the 16th century, only a few handful paintings are available from that period. 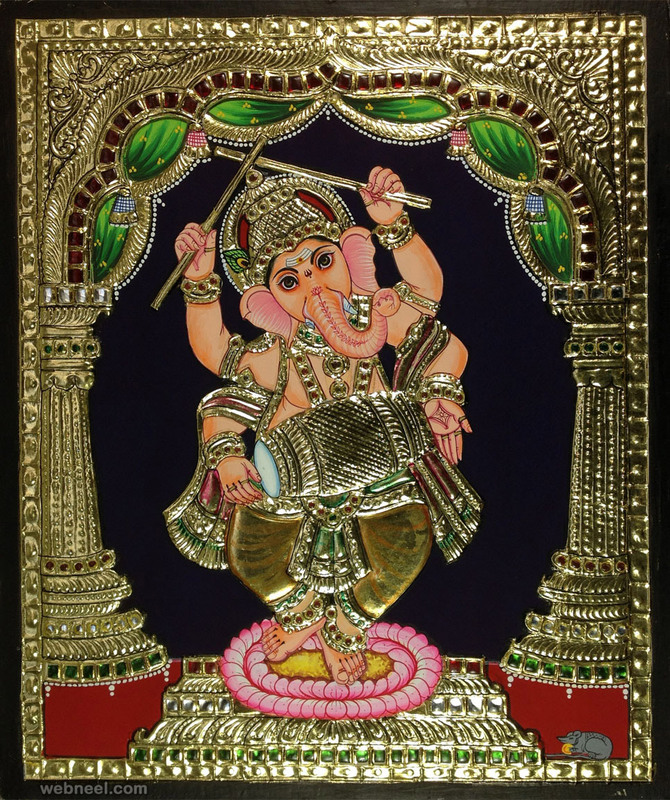 Tanjore Painting Techinque: Tanjore paintings are created using semi precious stones, glass pieces and 22 carat gold foli, which is used to fill the surroundings. 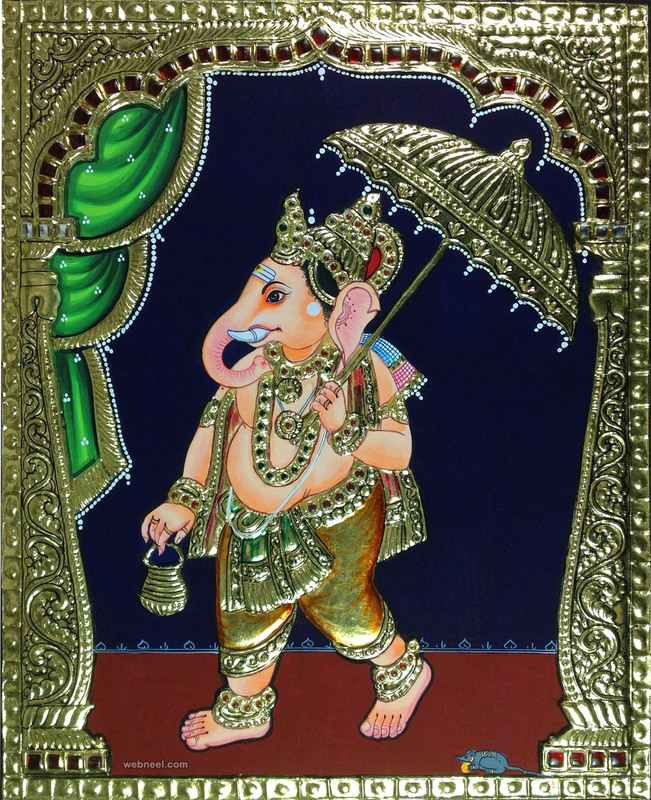 Tanjore paintings are created on wood and cloth made canvas. 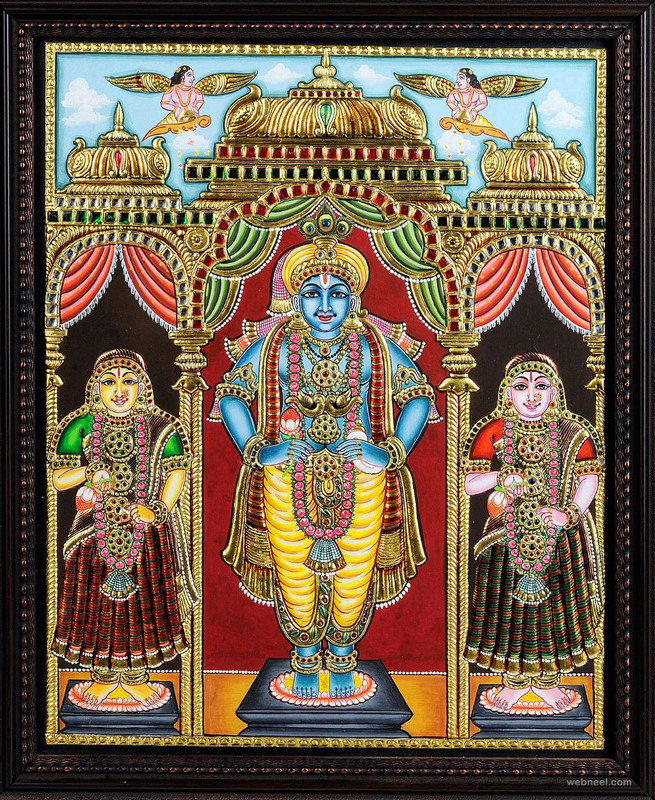 Tanjore paintings are normally framed, to protect them from pests. 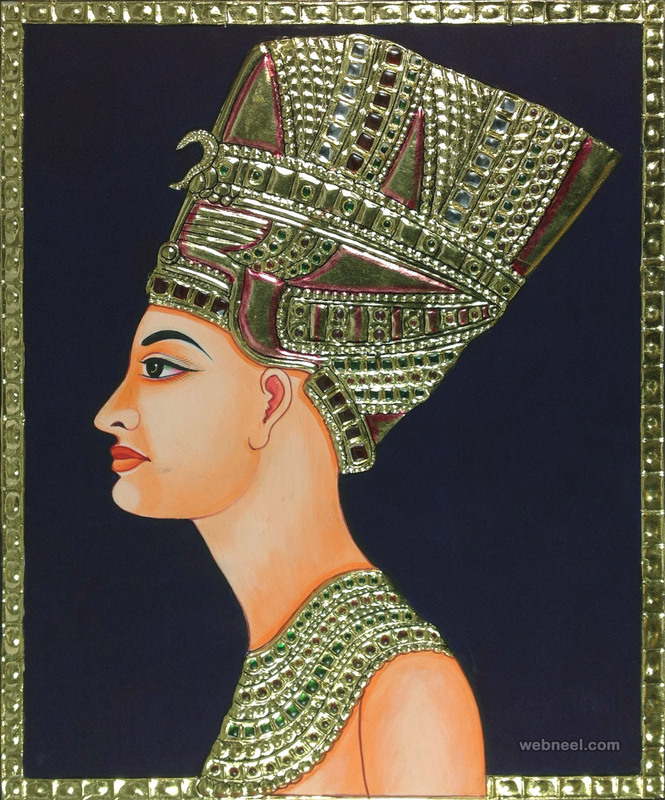 To create an embossed effect a mixture with chalk powder and gum is used and the semi precious stones are fixed on top of the paste. 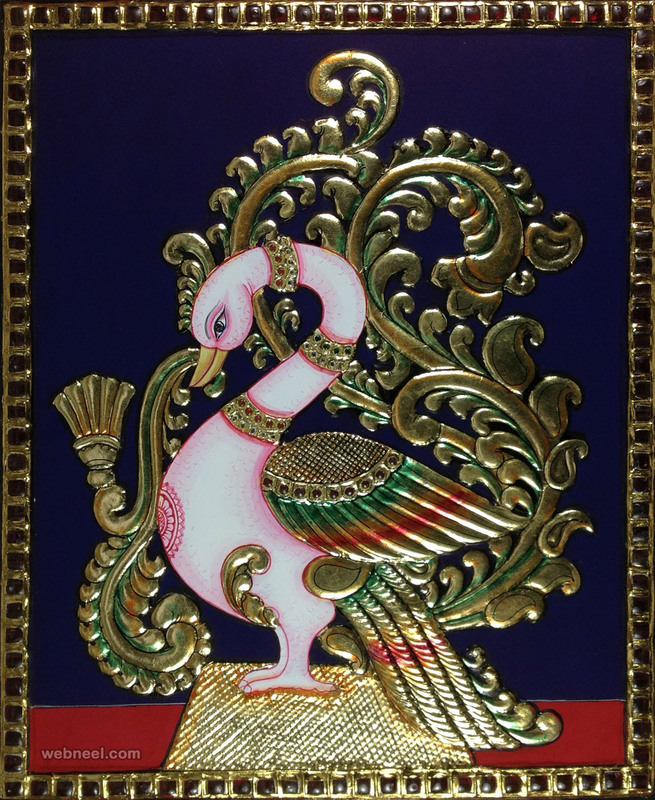 Since high quality 22 carat gold foil is used, these thanjavur paintings can last for many generations, and even a medium sized painting will be on the slightly expensive side. 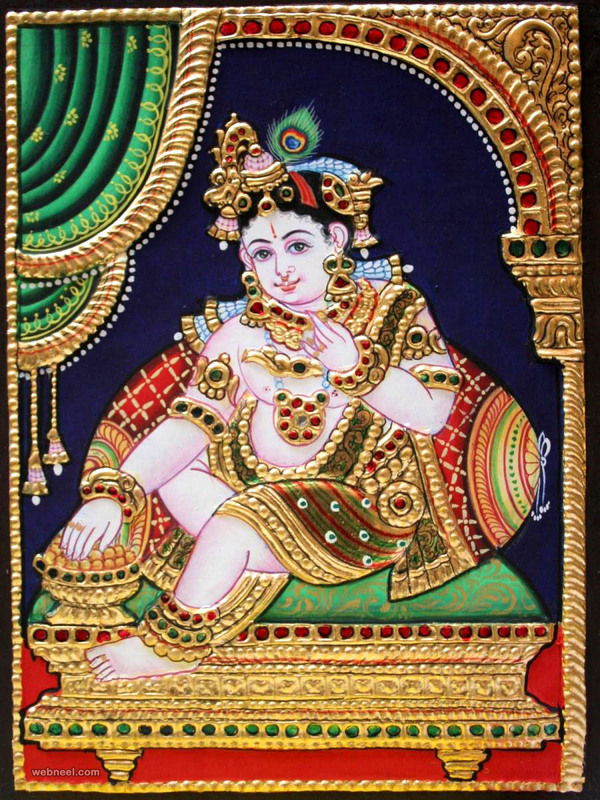 Tanjore paintings require a lot of dedication and meticulous work from the artists. 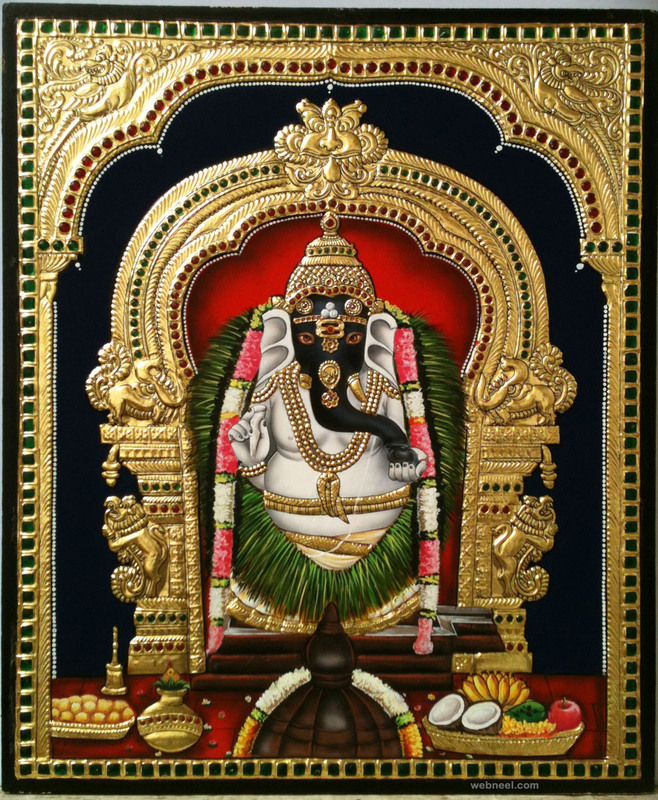 To create a medium sized tanjore painting, artists can take anywhere between 3 to 6 months to complete it.